A few years ago, I spent a memorable evening with my friend Scott Rains. 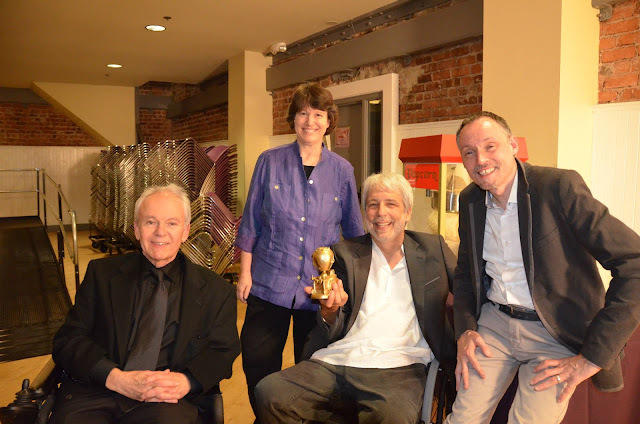 Although Scott and I had only met online before that day, he was kind enough to let me tag along with him to the 2013 Superfest Disability Film Festival in San Francisco, an hour’s drive north from San Jose. The event that year took the form of a mock awards ceremony called The Dissies, wherein satirical honors (to wit, gold bobbleheads of Timmy from South Park) were bestowed upon the most egregious portrayals of disability tropes in the history of film. (If you missed out, there is video posted here: https://youtu.be/epE67x5Ns_w - Scott’s dramatic turn as Dr. Strangelove accepting his “Dissie” appears at 1:02:50.) The film clips and speeches were hilarious, and the joyfully defiant solidarity in the room was palpable. Scott and I had a great conversation on the way home. He remarked on how alienating it can feel to sit in a movie theater and feel like the only one who’s bothered by the message on the screen, and in contrast how empowering it had felt to sit with hundreds of like-minded members of the disability community and mock the foolishness of those demeaning messages. I am so grateful to have taken part in that day. Today, I sit looking at the juxtaposition of two upcoming events on my Google Calendar. This weekend marks the widely-anticipated premier of a movie that deserves a “Dissies” event all its own: the film adaptation of the 2012 novel, Me Before You. Just days later, there is a memorial service for Scott. I will be attending only one of these events, and it won’t be the movie. As the disability community reacts, with understandable distress, to a film trailer wherein a quadriplegic protagonist tells the woman he loves, “I don't want you to miss out on the things someone else could give you”… I think of Scott and wish he were here to scoff this foolishness with me. How we would have rolled our eyes at the irony of using a #LiveBoldly hashtag to promote a movie about a guy who is determined to die! But Scott is gone, and Me Before You is just beginning its life as a cultural phenomenon. Nobody ever said it was a just world. Scott became a quadriplegic in 1972, when he was seventeen. Adapting and moving forward, he went on to study abroad, earn a PhD, marry, teach, serve as a pastor, work as a consultant, travel the world, speak and blog to a wide audience, and revolutionize the movement of accessible tourism. Scott epitomized “living boldly.” He did so, not to defy expectations or to prove a point, but out of his innate joy and curiosity. He loved exploring, taking photographs, befriending and mentoring others, and building alliances to create positive change in the world. He was one of those people who make everyone feel like they’re his best friend. Scott was diagnosed with an inoperable brain tumor on the last day of 2014. Even when he communicated his prognosis clearly, people obviously couldn’t believe that this vibrant and expansive man wasn’t going to get better. The last time I saw him, we laughed about the social media response to his photos. Any time an old picture of a youthful and energetic Scott appeared, it would be met with a flood of celebratory comments about how much better he was looking, and how he’d be back on the road in no time. He tolerated the wishful thinking with good humor. Scott wasn’t getting better, and he knew it; but he outlived his initial prognosis and made the very most of the time he had. He died at home a month ago, peacefully, with his wife by his side. He sought neither to hasten his death nor to turn his last months into a pyrrhic battle; rather, he weighed his options, lived his values, and gave as much time and energy as he could to those he loved. He set an example in death as he did in life. I’m not trying to idealize Scott. I didn’t know him well enough to know his flaws and struggles, but that doesn’t mean he didn’t have them. People are complicated, irrespective of disability; and the tendency to perceive people with disabilities as either mythically positive or stereotypically bitter is one of the many ways in which we able-bodied folk make their lives more difficult. I’ve had dozens of friends and acquaintances over the years who have lived with quadriplegia, and shockingly enough, they’re just… people. My best quadriplegic friend helped me to rejoin the human race when I was at my most defeated, and unquestionably made me a better person by being in my life. My worst quadriplegic friend ended our friendship without warning and vented his contempt to others rather than bring his issues to me as I trusted a friend to do. Funnily enough, those best and worst friends were the same guy. Like I said, people are complicated, and life is just like that sometimes. We’re all a mess in one way or another, and disabled people are in no way obliged to be any less messy and contradictory than anyone else. It isn’t their job to embody other people’s narratives, whether that means personifying somebody’s idea of tragedy, or inhabiting somebody’s pedestal of triumph and “inspiration.” People are entitled to simply live and make the most of the hand they’re dealt, without having other people second-guess the value of their lives. They are entitled to write their own messy, complicated stories. There are those who argue that Me Before You illustrates this principle of free choice and autonomy; but they are overlooking the fact that the character making the choices was penned by an able-bodied author who, by her own admission, had never met a real person with quadriplegia before she wrote the novel. Jojo Moyes is a British author who was moved to create Will Traynor, the disabled protagonist of Me Before You, because she was troubled and intrigued by the real-life story of Daniel James, the young rugby player who chose assisted suicide at Dignitas following a disabling injury. Moyes’ impulse to explore the emotional terrain of James’ decision in a fictional context was not, in itself, a bad thing. “If you have a story that won’t leave the front of your head, that’s what you need to write about,” she has explained. She is a gifted writer and a compassionate person, but she botched this project, and she didn’t put herself in a position to be reality-checked by anyone who could have shown her where she was going wrong. The problem is that Moyes conflated two fundamentally incompatible goals as she crafted her novel. The first was to ask, given a person in despair following a loss of physical ability, what could make that person’s life worth living again? The second was to ask, how could Daniel James have chosen to die as he did, and have convinced his family to support and facilitate that choice? Moyes failed to realize that the same story could not possibly answer both questions. She invented the character of Louisa Clark – a love interest for Will who has no counterpart in the real story of Daniel James – to drive the quest to give Will’s life new meaning. Leaving aside the fact that we all have to find meaning for ourselves, Moyes set Lou’s mission up to fail, because Will’s eventual decision was a foregone conclusion. Did Moyes mean to assert that life with a disability cannot be worth living? Of course not, she protests - Will is just one individual. True enough, but he is the only individual Moyes has crafted as a vehicle for exploring this question. She throws in a few nominal quads who choose to live, faceless placeholders that Lou meets in an online support group, but they are never developed in a way that portrays a real person finding real value in life. They’re just proxies for choosing to live, and ambivalent proxies at that. The bottom line is that Moyes abandons her question about finding reasons to live, in favor of her compulsion to explore why one man chose to die. It was never possible to do justice to both questions, and Moyes did far more harm by posing an important question she did not intend to answer than if she had never asked it in the first place. I won’t be going to watch the latest albatross of tragic stereotyping get fastened around the necks of people I love and respect. I will be going to a memorial service, if I can even get a seat in what I’m sure will be packed house. I will be gathering with others whose understanding of “living boldly” was enhanced by the privilege of knowing our friend Scott. I will be wishing that all of those moviegoers were getting a chance to know a real guy with a huge heart and a smile to match – a man who loved his life, loved his family and friends, and loved the world that he savored every opportunity to explore. I will be wishing that all those people who will be wiping away tears in dark movie theaters could be mourning for the real Scott Rains rather than for the imaginary Will Traynor. Maybe somebody will make that movie someday.